Mother's Day is upon us, and if you haven't written a Happy Mother's Day card yet, don't despair. You can easily find free printable Mother's Day card online. No need to go to a Hallmark store. The best part is that you can often customize the cards to look exactly like you want them to. You can find some great free printable Mother's Day cards at DLTK Holidays, a site run by a mom with two kids. They have a neat custom greeting card generator that walks you through the whole process of creating your own personalized card. In addition, kids can print out poems and other foldable cards. Your kids might also enjoy the free print-and-color Mother's Day cards from Kaboose. 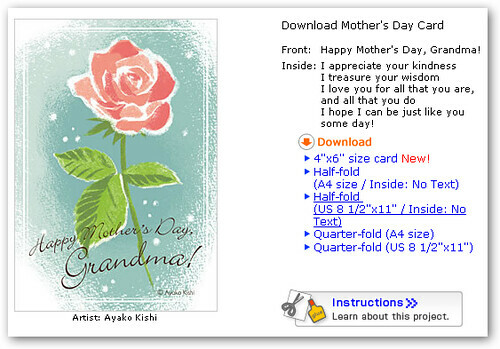 Canon, the printer maker, also has a nice collection of downloadable Mother's Day cards that you can print out. The cards come in various folding styles: half-fold, quarter-fold, and a 4"x6" card. Remember, since you'll be printing your Mother's Day card from your browser, make sure to disable the default printing of the time, date, and URL when you print your card. You can change these settings in Internet Explorer by going to File->Page Setup and deleting the text in the Header and Footer fields. It's also best if you can find good-quality, thick stock paper to print your Mother's Day card on for the most authentic effect.